I've been wearing this combination of colourful cardigan, printed top and skinny jeans often. It's a great stay-at-home-mum outfit, and extremely comfortable. Wore this out to toddler time at the local library with toddler T. It's not the first time that I've worn this tee and jeans together before (although it was warmer last time I wore the combination!). It's a nice easy outfit. Last time I wore it with a colourful scarf, this time around with a colourful cardi. The only thing I didn't like about this outfit was the necklace - I think a different necklace would have worked better. 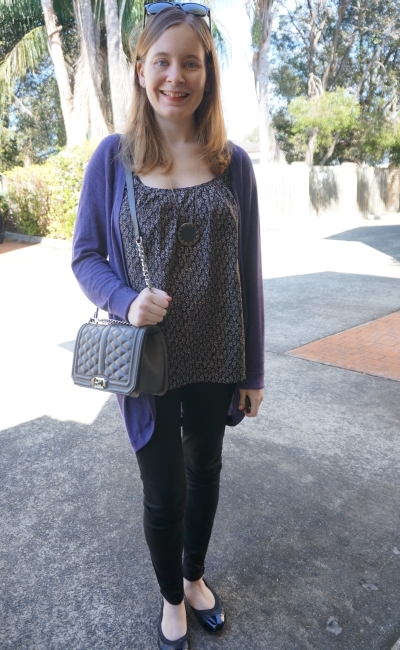 Last worn: Ray-Ban Wayfarer, purple cardi, striped tee, prima skinny jeans, studded mouse flats, Rebecca Minkoff Love bag. Other ways to wear: purple cardi and maxi dress, striped tee and a baby bump, skinny jeans layered up for winter, studded mouse flats and a maxi dress, maxi skirt and Rebecca Minkoff Love bag. Another really easy spring outfit (incredibly similar to this one!). You can tell I've been enjoying not having to work my wardrobe around my knee bandage now that my knee has mostly recovered - I've been alternating between my favourite pairs of skinny jeans! It's good to wear them again, wanted to get as much wear out of them as possible before Frocktober, and before the really warm spring weather hits. Wore this out for a catch up with some of the mums and bubs from playgroup. We try get together in the school holiday breaks as well so it's not too long between seeing each other. It's always good to chat and compare notes about how we are handling the latest toddler developments! Last worn: Ray-Ban Wayfarer (above), kimono cardi, printed cami, black skinny jeans, ballet flats, Rebecca Minkoff Love bag (above). Other ways to wear: kimono cardi and a maxi skirt, printed cami and skirt in summer, black skinny jeans and a plaid shirt, ballet flats in the office, Rebecca Minkoff Love bag and printed shorts. Linking up with Flashback Fashion, Fab Favourites, The Ultimate Rabbit Hole. Beautiful how the cardigans harmony with the print of your tops, Mica. Your second outfit is my fave. Love your cross body bag by Rebecca Minkoff. Happy Friday, Mica. Love the bag!! So stylish! Gorgeous! 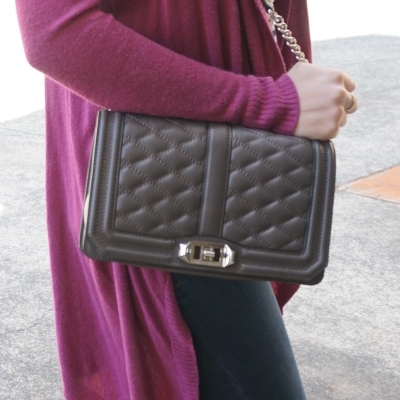 I love your bag and the purple tones of your cardigan! Cute looks! Love the colors of your cardigans! The burgundy looks so great with the stripes! You are so cleaver at hiding that cute bump! I cannot even see it in these pictures. Excited for you! 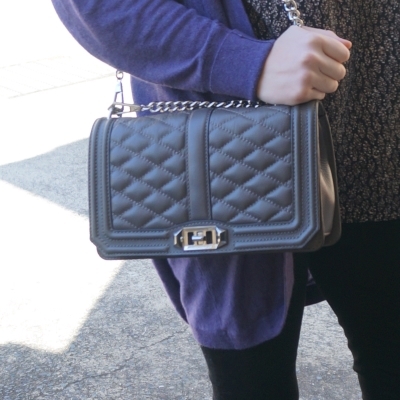 That bag always catches my eye - its a classic that automatically adds the chic note to the look. Love your pink cardigan , it's really pretty!! Oh, I love that purple sweater! And that bag is cute too! This is a great SAHM outfit! Cardigans are so easy to clean if someone gets a little messy too...haha! i love both cardigans! they drape beautifully over both outfits Mica. that purple is gorgeous. I love both of these outfits...and you know I love that long purple cardigan...and I think the necklace is lovely but it would look better if it was a bit shorter (with this combo) perhaps next time you can tie a knot in the back...I do that when I want to shorten a necklace. I do like the second outfit too...that bag is so perfect for it! makes the look tres chic. I'm very happy to hear about the how you and your collegues are wearing dresses to support reaseach about Ovarian cancer...It is important to raise awareness about Ovarian Cancer...and you even did a fundraising! that's fantastic! My mother was diagnosed with cervix cancer when she was two months pregnant with me and because it was diagnosed so early on, she managed to carry out her pregnancy with me (obviously for here I am;) and she had some kind of laser surgery where it was removed (apparantly that is possible if the cancer is in very early stage and it is not widespead)....so early prevention is really key! I'm glad your mum had such a success story and was able to catch and treat it early! That's the worst thing about ovarian cancer, there is no early detection test :( I'm hoping to meet my fundraising goals through the month! Love the striped shirt and pink cardigan! Great colour combo! You look great in both outfits! I love the color of the first cardi. These are my go-to kind of outfits, too! Colorful cardigans can really make an outfit looked pulled together. Love the pink and purple ones you are wearing! Beautiful looks! The cardigans look lovely! Coloured cardigans are the best, aren't they? I think a different necklace would've worked better with the first outfit, too, but nonetheless, these are such comfy outfits to wear! Something I'm sure to repeat again - as it is so comfy! With a shorter necklace of course though, haha! And I am a big fan of skinny jeans as well - they really are perfect for everything! I love that blouse with that cardigan! They go so well together! I adore both and I think that necklace works!! Love the colors of both cardigans! another great bag that i MUST have!! Love your cardigans! So pretty!